When you step into the oral hygiene isle at your local store, you are surrounded by an abundance of options when it comes to dental products. With so many choices, it can be difficult to determine which are effective for meeting your specific needs. As your preventive dentist near Erlanger, Dr. Danny Nakhla wants you to make the best decision because your home oral hygiene is your first line of defense against dental problems, like tooth decay and gum disease. He has the information you need to choose the best toothpaste and mouthrinse to meet your needs. Now, you have a wide range of options when it comes to toothpastes. The first thing you need to look for is the American Dental Association’s (ADA) seal of approval. This seal is only given to products that have been deemed safe and effective by the ADA. In addition, choose one that contains fluoride to strengthen the enamel to help prevent cavities. After determining which toothpastes meet these two requirements, you need to take your individual needs into consideration to make your final decision. Anti-Gingivitis: If you have a high risk for gum disease or are currently fighting the infection, choose a toothpaste that caters to gingivitis. This will help to reduce harmful oral bacteria to help prevent and control the condition. Desensitizing: Tooth sensitivity can be managed with a desensitizing toothpaste, which works to block the tooth’s pain signal to the nerve. With 2 weeks of regular use, you will see an improvement in the discomfort. Tartar-Control: Prevent the buildup of tartar and plaque with a toothpaste that caters to tartar. While it will not remove existing accumulations, it will reduce the buildup of new tartar. 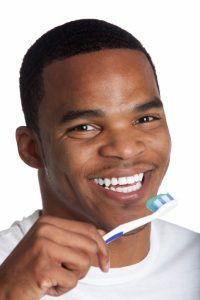 Whitening: Whitening toothpastes help to remove surface stains to maintain your natural tooth color. Although you will not achieve drastic results, you will help to reduce the appearance of surface discoloration. A mouthrinse can do more than just keep your breath minty fresh. They can also aid certain dental problems. As with toothpastes, look for the ADA seal of approval and consider your specific needs. Fluoride: Mouthrinses that that contain fluoride will bathe the teeth to help reduce the occurrence of tooth decay. Alcohol: If you tend to have high levels of oral bacteria, a mouthrinse that contains alcohol can be beneficial to kill germs. However, if you have dry mouth, choose one that is alcohol-free. Antibacterial: You can help manage and prevent gum disease with an antibacterial mouthwash. While it is not a cure, it will help to reduce oral bacteria. Anti-Plaque: As with toothpastes, some mouthrinses can help to reduce the buildup of new tartar to protect the teeth from cavities and gum disease. Dry Mouth: If you suffer from dry mouth, a rinse that enhances moisture will help to reduce bacteria while improving your symptoms. Fresh Breath: Combat the odor of bad breath with a rinse that reduces oral bacteria while leaving your mouth minty fresh. Your oral hygiene products are vital to protecting your dental health. However, home oral hygiene is only half of the care you need. With the right products and regular preventive care from your dentist near Erlanger, you will ensure a healthy smile.